This book is about weather extremes in the United Kingdom. It presents fascinating and detailed insights into tornadoes (supercell and non-supercell tornadoes, historical and contemporary case studies, frequency and spatial distributions, and unique data on extreme events); thunderstorms (epic event analysis and observing); hailstorms (intensity, distributions and frequency of high magnitude events); lightning (lightning as a hazard, impacts and injuries); ball lightning (definitions, impacts and case studies); flooding (historical and contemporary analysis, extreme rainfall and flash flooding); snowfalls (heavy snowfall days and events). It also looks at researching weather extremes, provides guidance on performing post-storm site investigations and details what is involved in severe weather forecasting. It is written by members, directors and past and present Heads of the research group the Tornado and Storm Research Organisation (TORRO). 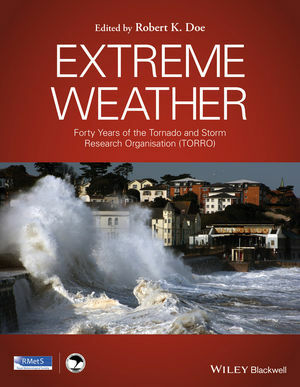 With fifteen chapters thematically arranged, and data appendix including a new tornado map of the U.K., this book presents a wealth of information on meteorological extremes. This volume is aimed primarily at researchers in the field of meteorology and climatology, but will also be of interest to advanced undergraduate students taking relevant courses in this area. Robert graduated with a Ph.D. from the University of Portsmouth, where he specialised in coastal storm climatology. Robert is a Director and Treasurer of The Tornado and Storm Research Organisation (TORRO). He is a Fellow of The Royal Meteorological Society (FRMetS) and Member of the Royal Institution (MRI). He was Editor-in-Chief of The International Journal of Meteorology (2002–2006) and has published research on meteorological phenomena including; tornadoes, waterspouts, floods, snowstorms, ball lightning, coastal storms, climate and risk. He is an Honorary Research Fellow in the School of Environmental Sciences, at the University of Liverpool.